Chasing Mummies is a television show in the Reality genre starring Zahi Hawass, Leslie Greif, and Dr. Allan Morton. The tv show first appeared on air on 2010-07-14. Our users found the overall impression of this television show to be Educational. 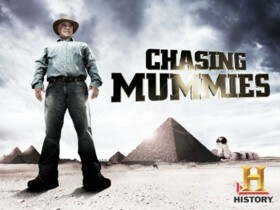 The tv show's official site can be found at www.history.com/shows/chasing-mummies. This is quite an interesting reality/history show on History Television. I have to say that right away I was intrigued with this show as I find Dr Zahi Hawass to be quite informative and funny although he can come across as arrogant and mean. The basic idea behind the weekly episodes is to follow Dr Hawass and his interns as they discover new Egyptian antiquities. This is actually more fun to watch then I thought as Dr Zahi constantly gets irritated with his interns and it ends up being quite entertaining. The sets are obviously quite beautiful and interesting as it is Egypt, but the plot is basically non existent. If I was going to state one negative for this show it would be that I am not sure if it is scripted or real as I really doubt that Dr Zahi would treat people as badly as it seems he does in real life as he does on this show. Overall this show is pretty fun to watch and I recommend you give it a watch when you feel like learning as well as being entertained.